To sanctifyHaShem, the one and true G-d, and His Torah I made this organization on the internet to try to help the entire world whether it is possible or not. Hello and welcome to my home page. Please stay and learn some Torah for your sake and for the sake of the entire Jewish Nation. Sign in...to learn Torah through the internet by voice. "On three things the world stands: On Torah, on Davening, and doing kindness to others" Pirkei Avos (1:2). The Torah learning center is on its way of being constructed. The page to help people is there, except I need the people being involved in it as well. Please sign up so I know who will show up for the class. For more information go to http://members.tripod.com/~Hayim/Torahlearninghome.html and please sign up there. If you have a Halahic problem please go to the "Shemah Yisroel" home page- ask the Rabbi. If you or your friend has a problem in "Midos" or have a problem which you can not solve please e-mail me because I am here to help anyone and everyone in need. I am starting soon a review of Elu Metzios. It is a very important Mesechta and I encourage anybody who likes to learn Halahos (this will really help you when you will face a problem of a lost article) to participate. Each Daf will be very short. To actually complete the entire Mesechta will take around 236 Dafs. I will go about 1 lesson a day. If anybody is interested please e-mail me. 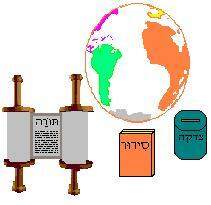 Please go to my list of Torah organizations around the net. "Chofetz Chaim a lesson a day". It teaches Shemiras Haloshon (something which much of the people are lacking). An organization that deals with Kashrus and the problems pertaining to it. Thank you for coming in and learning something. Please send e-mail to Chaim if you have any questions or comments. is owned by Chaim Vaks. This page was last updated on - December 8, 1997.
started on March 31, 1997- Chaim.